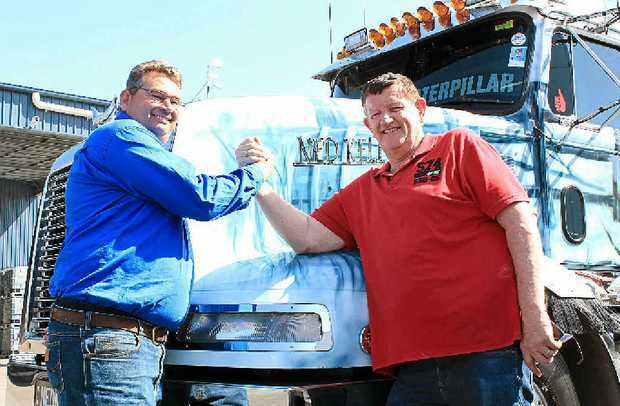 ONE of Brisbane’s biggest trucking events, the Brisbane Convoy for Kids is set to roll on November 1. But it’s not just the trucks that you will want to see - already confirmed is country star Jayne Denham, Terry Kennedy, Shotgun Duo and Darren Scott to perform on the day. Convoy for Kids treasurer Leanne Dinning said the committee expected big numbers this year with Hastings Deering Cat coming on board as a sponsor. Utes muster at the Redcliffe Showgrounds for the Brisbane Convoy for Kids. So far 2012 leader Andrew “Scuzzy” McSweeny is once again competing to lead the convoy by raising the most money, and so is 2013 leader Barry Land. But with only five trucks in contention for the lead there’s five places in the top ten left. All the money raised from the Brisbane Convoy for Kids, which became a registered Australian charity this year, ends up being donated to charity. Last year Riding for the Disabled received $25,000. This year’s main beneficiaries will be the Redcliffe and Beenleigh special schools. The committee also hopes to donate some money to Riding for the Disabled again, and to the Emerikus Land Foundation. “We try and spread the money around to help as many people as we can,” Ms Dinning said. The convoy leaves Stradbroke St at Healthwood at 9.30am on November 1 and heads to the Redcliffe Showgrounds where gates open at 11am for a family fun day. On the day there will be a truck and ute competition as well as a truck pull and displays, rides, stalls, fireworks and more. Camping is available, see www.brisbaneconvoyforkids. com.au. The Brisbane Convoy for Kids leaves Larapinta bound for Redcliffe. 1. Chris Wilson, TKE Haulage.